Johnson plastosonic makes Ultrasonic Fabric Sealing Machine. 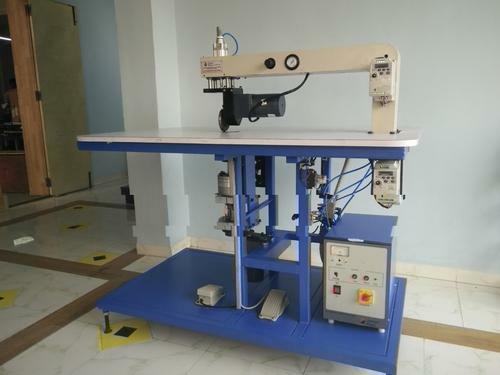 Ultrasonic sewing machines, spot welders continuous sealers and equipments are made for filter fabric sealing. Due to environmental compliances HDPE bags LDPE bags are fastly replaced by PP non-woven fabric bags. Johnson Plastosonic provides state of the ate Indian make ultrasonic generators & horn assembly for bag making machines. Do not be in trouble for imported ultrasonic generators & systems, Replace it by Johnson's Indian made systems, Johnson gives continuous high speed fabric sealers for bag making machines. Johnson Plastosonic Private Limited established in 2007 has emerged as a leading manufacturer and importer of Ultrasonic Liquid Processors, Ultrasonic Plastic Welding Machines, Ultrasonic PP Corrugated Box Welders, Ultrasonic Hand Press and many more. Johnson Plastosonic Private Limited started originally as name of M/s National Indosonic. The company started it’s operations by providing services in field of ultrasonic plastic welding machines. Ultrasonic plastic welding machines are the machines in which ultrasonic vibrations are used for joining thermoplastic materials. Mostly the injection molded parts are joined by ultrasonic plastic welding process. As well as parts manufactured by vacuum forming process, blow molding process, fabric made by woven and thermoplastic welding process are being joined by the ultrasonic welding process.The plastic is being melt by giving vibrations of frequency 20khz & above. In 2001 company has made first ultrasonic plastic welding machine.Later company has made lot of research & development work. In 2007 company has changed from an enterprise to Pvt. Ltd. Unit.